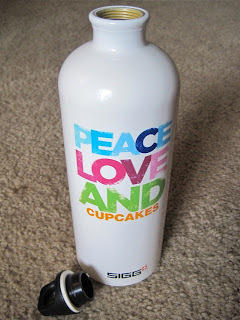 A Daily Dose of Fit: Peace, love and cupcakes...and water. Nike, Amphipod, GoLite...they all make hand-held water bottles. Get one with a strap and a pop top. The strap keeps it snug to your hand so you don't really have to hold the bottle, and the pop top makes it easy to access the water using just your mouth. You'll also want to pick one that isn't clunky because as soon as you add water, you'll be adding a small amount of weight. You can also buy a special belt that has a series of smaller water bottles attached to it. Distance runners use them if they plan to supplement water with a sports drink. I've never used one myself, so I can't tell you how good or bad they are. OOOOOOOH my gosh, I NEEEEEEED that water bottle! You know how much I loooooove sweet treats!!! I use the Amphipod. Little. Lightweight. And a pocket for keys and sport beans during long runs.